Thousands of Algerians rallied again on Friday to demand the immediate resignation of President Abdelaziz Bouteflika, who is fighting for his political survival in the face of relentless protests and the desertion of long-time allies. The protests were expected to swell further after Friday prayers, as has happened on the four previous Fridays during this wave of demonstrations that kicked off on Feb 22. In the most significant development in a month of demonstrations, Chief of Staff Lieutenant General Ahmed Gaed Salah on Wednesday threw the army’s weight behind the protesters, saying they had expressed “noble aims”. The ruling National Liberation Front party, known by its French acronym FLN, has also sided with the protesters. When the “Arab Spring” revolts toppled autocrats in neighbouring countries, Bouteflika used oil revenues to secure loyalty — offering better salaries for state workers, housing and low-interest loans. Algerians who credited Bouteflika with negotiating an end to the civil war in the 1990s were eager for stability, even though they shared many of the frustrations which triggered revolts elsewhere. 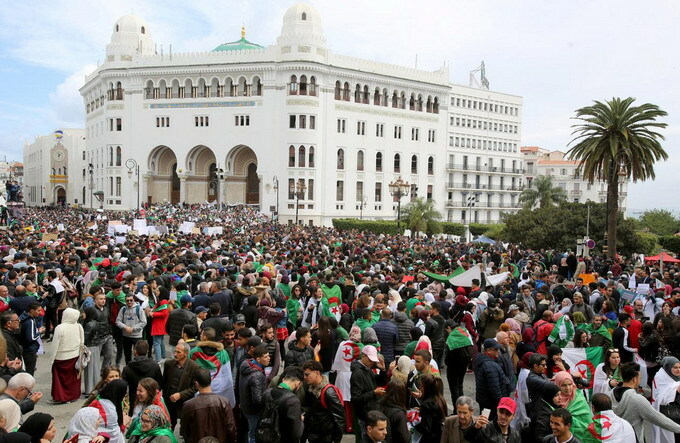 While Bouteflika was adept at manipulating the opposition in the past, he now faces Algerians of all social classes and ages staging the biggest protests in decades. Even if Bouteflika quits, it is not clear if the swelling protest movement can bring down the deep state – a secretive network of ruling party leaders, business tycoons and army generals long regarded as invincible. These figures, who long managed politics in behind-the-scenes negotiations, may be happy to see Bouteflika go but are likely to resist any major political changes, as they have done in the past.